Get ready, Roughriders! 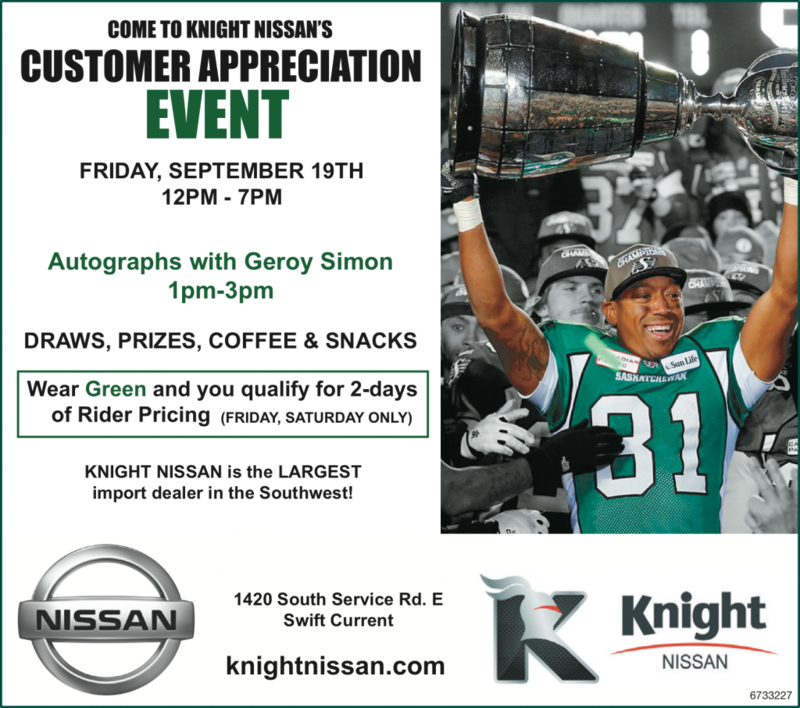 At Knight Nissan, we’re happy to be able to show our appreciation for our customers from Swift Current and the surrounding communities by hosting former member of the Saskatchewan Roughriders and three-time Grey Cup champion, Geroy Simon, at our dealership in Swift Current. Our Customer Appreciation Event will be on Friday, September 19, 2014 from 12 p.m. to 7 p.m., and Geroy Simon will be signing autographs from 1 p.m. to 3 p.m. There will be draws, prizes, coffee, and snacks to celebrate the occasion. And those who show their Roughriders pride by wearing green to the event will be eligible for two days of Rider pricing on Friday, September 19 and Saturday, September 20. Geroy Simon had a storied career in the CFL. He is a three-time Grey Cup champion, with his last championship coming with the Saskatchewan Roughriders. He is also the all-time career CFL leader in receiving yards (16,352), first in pass receptions (1,029), and third in touchdown receptions (103). The opportunity to meet him and get his autograph should not be missed by CFL fans! We’re proud to show our appreciation of our customers by hosting a Customer Appreciation Event featuring Geroy Simon, and we hope to see you there! For more information, contact us online or call us at (306) 778-7000.